Two weeks ago today, Christians around the globe celebrated a fervent ritual of eating anything and everything that’s good and greasy. In honor of Shrove Tuesday (Mardi Gras), we cleaned out our pantries in hopes that with the foodstuffs gone, the temptation would cease, too. After all, this is the sacred season of Lent, a time of remembrance repentance, and sacrifice. When I was 29, I celebrated Shrove Tuesday at Binkley Baptist Church’s Annual Pancake Supper with a sense of purpose, walking into the Lenten season with a mission—the first I’d ever had in all my days as a born-and-bred Baptist. I was going to become a vegetarian. It’s likely that Jesus wasn’t a vegetarian. He probably ate what was native to his homeland: fruit, fish, olives, and bread. He might have even had wine on occasion [Southern Baptist gasp!]. I once heard Dr. Roberta Bondi share a story on Jesus’ alcohol consumption. But giving up the booze and chocolate, trading in the flour for fasting—these acts are not by themselves satisfying or purifying. It’s the intention that makes them spiritual. Why are you doing what you do for Lent? My cholesterol may benefit from a Lenten choice of vegetarianism, but will my Spirit? In 2010, my Lenten commitment to vegetarianism had a spiritual intention. I was five months away from marrying the love of my life, who happens to be a devout Hindu and vegetarian of more than 10 years. Choosing vegetarianism meant solidarity with Fred, as well as a commitment to our interfaith household. It was a decision with both spiritual and material benefits (check out “4 Important Reasons to Be Vegetarian”). Whatever practice we’ve added or taken away during our 40 day journey, the intention is key. Are we fasting because we want to be closer to Jesus in the wilderness, or simply laying off the sugar in order to drop a few pounds? Are we allowing the “holy rhythms that bring restoration and direction”* into our lives? Or just getting a break from the TV? We’re two weeks in, but there’s still plenty of Lent to go around. Here are 40 ideas for your journey; choose your intention today. March with Jesus toward his crucifixion and resurrection, where we are reminded that love always wins. Jesus may not have been a vegetarian, but I’m certain he ate, served, worshiped, and sacrificed with spiritual purpose. This season, we join him in that that purpose. 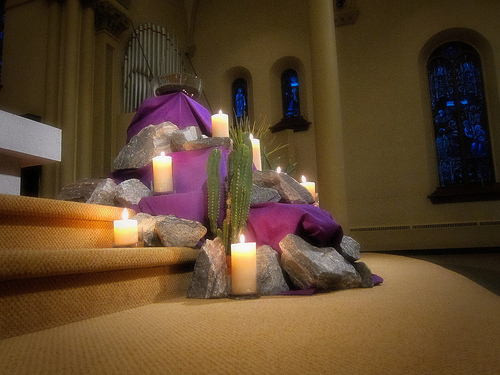 What is your Lenten practice? Share your experiences and observations of Lent 2014 below as we also remember the accountability of this season. *Bishop Joe Pennel, “Prayer Workshop: Finding Sabbath During Lent,” Upper Room Daily Devotional, March-April 2014. I gave up stuff… At least I’m trying to. I trying the 40 bags in 40 days to rid myself of excess stuff in an attempt to focus more on God and devotion to God. Really it’s a focus on ridding myself of the unecessary to make more room for the necessary. Yes! Amen. I love this Lenten intention. Thanks for sharing.